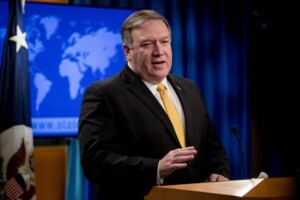 WASHINGTON – Secretary of State Mike Pompeo has announced that the U.S. is pulling out of a treaty with Russia that’s been a centerpiece of arms control since the Cold War. The American withdrawal had been expected for months. It follows years of unresolved dispute over Russian compliance with the 1987 pact, which bans certain ground-launched cruise missiles. U.S. officials also have expressed concern that China, which isn’t part of the treaty, is deploying large numbers of missiles in Asia that the U.S. can’t counter because it’s bound by the treaty.